Netherland Dwarf Rabbit. 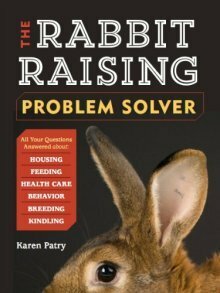 Learn about the risks - four specific genetic defects - that occur in litters of Dwarf rabbits (and dwarfed breeds), and how to manage dwarf rabbit care. 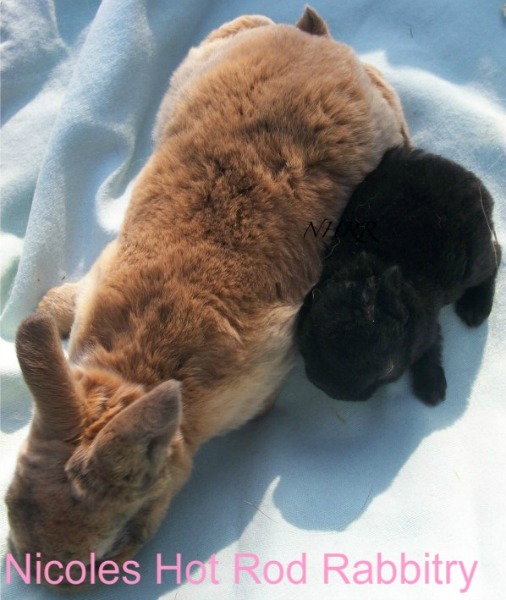 Netherland Dwarf breeders should know that Dwarfs are prone to at least 4 specific genetic traits and/or defects not known to most other breeds. Defects turn up in some Dwarf bloodlines more often than they do in others. These same defects are also likely to appear in small breeds developed through using the Netherland Dwarf rabbit in order to acquire the dwarfing gene. Here are those known defects, and what your dwarf rabbit care options may be. Sooner or later, every Dwarf breeder will find peanuts in the nest box - extremely tiny kits that have inherited a set of two dwarfing genes instead of just one. Double dwarfism is always fatal. See Dwarf Rabbits to learn more. When you see a peanut, it proves that both parents are true dwarfs, which have 1 copy of the dwarf gene and 1 copy of the normal size gene. Some breeders allow the peanut to die on its own; and some remove it from the box and euthanize it, as death is inevitable. If the nest holds only a few kits, it might help the living kits maintain their heat to leave the peanut with its littermates until it dies. Check the nest frequently, so it doesn’t remain longer than necessary and begin rotting and drawing flies. Below: Two pictures of "Binky," a tiny peanut that miraculously survived 4 weeks before dying. 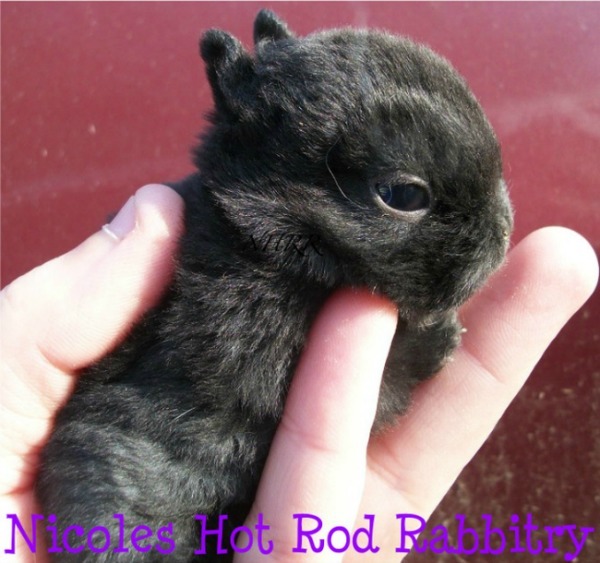 Used with the kind permission of Nicole's Hot Rod Rabbitry. This is a recessive defect named after "Max," a famous (or infamous) Netherland Dwarf buck known to sire kits with this defect. Max Factor babies are born with bent and deformed hind legs and their eyes are often open at birth, as though their eyelids were nonfunctional. They may also have other defects of varying severity. Max Factors frequently die within days, however some do live. If they live, their eyes remain unprotected and could be severely damaged in the nest box. They have mobility problems due to their deformities. Euthanasia is recommended. If allowed to live, the kits typically struggle through life with physical defects and weak immune systems. This is a genetic defect in Dwarf rabbits that is thought to be either related to the dwarf gene, or it is possibly another expression of excessive dwarfism. 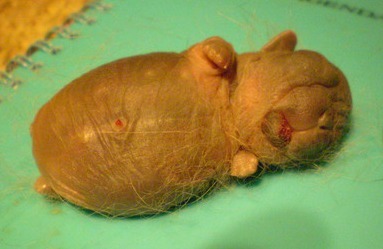 Hippo kits are usually born dead. They are small, short, and stubby, albeit very wide for their length. They have only a nub for a tail. 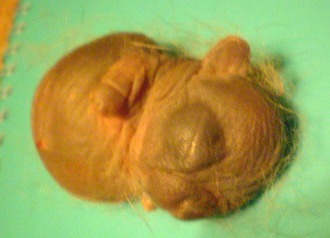 Pictures used by the kind permission of Dina: These are examples of dwarf hippo babies. This is a defect thought to be associated either with the dwarf gene or perhaps with a digestive syndrome such as enterotoxemia. Faders seem to not adjust to solid food. Instead, they don’t eat or drink; they hunch in a corner and grind their teeth. Death ensues quickly. Onset of fading, also called wasting, is around 4 weeks, but could also be as late as 6-12 weeks. Some Dwarf breeders believe there is at least a component of inheritance associated with faders. Netherland Dwarf Rabbit - "Big Uglies"
"Big Ugly" is the affectionate name for False Dwarfs. These are the Dwarf offspring that inherited 2 copies of normal size genes. See Dwarf Rabbits for more info on False Dwarfs. There IS a way to avoid producing lethal peanuts - use ‘big uglies’ (false dwarfs) in your breeding program. They have no dwarf gene to pass onto to their offspring. A false dwarf 'big ugly buck,' or BUB, despite excellent bloodlines, cannot compete on the show table. They are larger than 2 1/2 pounds. The ears may also be too long, and its proportions are not correct. 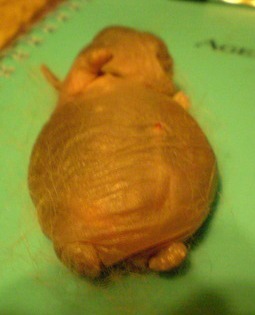 BUBs usually end up well-loved as pet rabbits. A false dwarf 'big ugly doe,' or BUD, if she has very promising type, can be an asset to your breeding program. She can't be shown, but her slightly larger size may enable her to carry and deliver a bigger litter. She may lactate well. And, she will pass a normal size gene to all her offspring, which when paired with a single dwarf gene from a True Dwarf buck, may create show-stopping true dwarf bunnies. 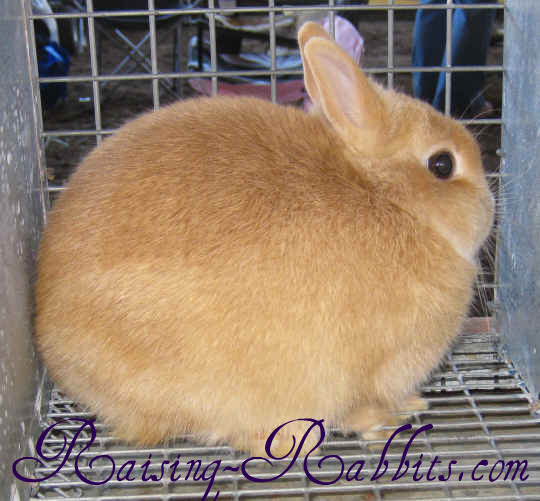 Don’t be afraid to include the exceptional, not-too-big False Dwarf in your Netherland Dwarf rabbit breeding program.